At last year's Caribbean Studies Association Conference (CSA), we discussed a lot the challenges that Caribbean Scholars face in publishing theory that might cross the Caribbean Ocean. Patricia Mohammed called this challenges in "Uploading". Though publishing to a blog is not the same as publishing a book, some in the region and throughout the world are taking advantage of this new means of publishing. Here are some examples. From Haiti, the son of Marcel Salnave Jr. has started a blog, Parlons Peu, to publish his father's journalistic works from the 1930s. A book by the same name exists and has been published in print in Haiti since the 90s but it is safe to say that more people have read the works online than have bought the book which was published only in Haiti. Historians or other researchers on Haiti can now have access to the works through a simple Google search. Caribbean writers such as Nicholas Laughlin who is on the panel today already publish their fiction online. Nicholas recently wrote an article surveying other Caribbean authors who do so. Last year, after meeting Dr. Matthew Smith at CSA, I interviewed him for my blog. Matthew is a Jamaica-based historian who specializes in Haiti and studies an often neglected period of Haitian History, the post-1950s. The interview generated a lot of interest and Matthew has since "starred" in a couple of documentaries on this under-researched period. Since he is with you at CSA this year, you can press him directly for additional information on the interview. I recall him emailing me that a grandson of Daniel Fignole -- an important, highly controversial yet mysterious and under-researched post-1950s figure in Haitian History -- got in touch with him, wanting to talk about his grandpa. Dr. Marc Lamont Hill's Barbershop Notebooks blog is good example of a blog kept by a young "public intellectual" who is also an academic here in the US. Haiti often gets short-shrift in the mainstream media. Reporters looking for shocking images or a scoop know they can find them in Haiti and indeed come and indulge. Unfortunately, that kind of kamikaze reporting does nothing to showcase all the other facets of Haiti and does not do as much to help it as one might think. Basic blogging software is available for free on the internet and if you can email, you can blog. I will not elaborate further because I know that Georgia (Popplewell) is presenting on the technicalities of blogging today. 4. Aggregators such as Global Voices Exist to Amplify Your Voice. Global Voices has regional and language editors whose job it is to let the world know what people from around the world are saying on their blogs and in several different languages. Take advantage of this and other aggregators and make your voice heard in the Global Information Highway. Cell Phone Costs Decrease in Haiti/ Could He Be Talking about Digicel? I came across this blog entry today on Moose's Adventures Abroad. Moose did not name his employer but could he be talking about Digicel, the new Caribbean Telecom Giant who recently made its grand entrance on the Haitian market, much to the chagrin of its competitors? People cannot afford mobile telephony at the current rates - they can afford it now. The number of mobile subscribers in the country could go from 3-4% to 60-80% (this is all speculation on my part). Honestly - it is a bit of a revolution - there is not landline phone network either so this is the first time many people in Haiti will have any phone! 1. the phones we market and push are the phones under $20 USD. 2. We don't accept credit and we don't reduce the price of phones and force them to take long contracts (in the mass market) like you see in North America. If a person wants to get an expensive phone they have to save up for it and in that case I think it is a legitimate spend. 3. Phones are always a balance of style versus function. In developing countries the large portion of the selection is based on price and function with style lagging behind that. 4. I have heard of a direct correlation between telecom growth and GDP growth in developing countries (not in the developed world). I can't find anything strong that correlates it... but telecom is an enabler. If teleco and technology improves communications improve which facilitates economic growth over all. Yes I realize this is very glossy, high-level and weak. Georgia recycles podcasts from all over the world in the first edition of the podcast The Global Voices Show. The francophone world has barely caught on to blogging, let alone podcasting, so it is not really represented on this 1st 17-minute edition of the show. But there are some hilarious clips from the rest of the world my favorite being a skit of a South African mother coming to grips with her son's gayness. See the profile I wrote of them on GV here. The article is from AlterPresse (Fr). I have a summary translation of it here. Basically, a study reveals that 20% of the mangos consumed in the DR come from Haiti. 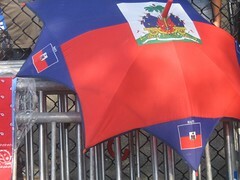 The article explains why Haiti needs to fight to maintain its global position in this industry. Apparently, worldwide consumers of mangos are quite demanding. Not that I blame them. I love mangos myself and although I consume loads of the Haitian kind sold here (Mango "Fransik", I believe) I often "cheat" with the yummy firmer red-skinned ones from Mexico. Sigh. Many locals have been amazed to find out how much the bloody revolution in Saint Domingue, now called Haiti, enriched New Orleans' culture and population. Refugees who left the island two centuries ago found new homes in South Louisiana, and their descendants are here today, sometimes unaware of their Haitian roots. And they came in large numbers, too. Between 1794 and 1810, rich and poor, black and white, free and enslaved flocked to the shores of South Louisiana from the wealthiest of the French colonies that maintained close ties to Paris. Among them were highly educated persons of color who became community leaders, teachers and writers. And yes, I too, AyitiCherieConnexion, was pleasantly shocked at how similar New Orleans traditional dishes were to everyday Haitian ones. I loved New Orleans during the summer I spent there and did indeed feel very much at home. 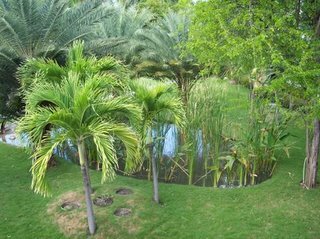 This interesting post on the Haiti Innovation blog outlines a set of recommendations for Preval. It is focused on policy and solutions rather than dwelling on the negative. Caught my attention but I know nothing about the organization and do not endorse it in anyway. Memories, memories, brought back by this lovely post on Francis Wade's Moving back to Jamaica. So says Nicholas Laughlin who has been looking into the matter. Read more here. This appears to be about Creole but it is also about condoms and differences in how they're sold in St-Lucia and Trinidad. But most of all, her musings on Grenada's Chinese Village at GV. Cover of Edwidge Danticat's The Royal Diaries. Activating Postmodern Cultural Keys for Global Balance and Sustainability. on the crucial question of aesthetics we will likely remain at loggerheads. My dear old dad, you see, did not much believe in beauty. For example, to my great chagrin he made my first bicyle out of a pile of parts he had collected at the no-joke, actual junkyard. The thing worked fine but was a mess to look at - seat, frame, spokes and handle-bars a mish-mash of styles and eras, states of disrepair and decay. I had to force him to put a new seat on (he was going to throw this crazy, gold-speckled banana seat he had found back in the junkpile), and it was another ordeal getting him to paint the thing a single color. I think he could have turned me on to the pleasures of symetrical ownership and sourcing sooner (i.e., pre-posthumously) if he had been less engineer and more artist, but therein lies the tale, right? Le président francais qualifie d’infamie, la traite négrière et invite les Français à « regarder tout notre passé en face », « sans concession ». Abdou Diouf, Secrétaire général de la Francophonie, salue la décision de Chirac. Cette commémoration, affirme-t-il dans un communiqué parvenu à AlterPresse, « vise à faire prendre conscience à l’humanité tout entière de la gravité de cette période dramatique qu’a été la traite négrière » ... Au musée du Panthéon, l’entrée est gratuite ce 10 mai, afin que le public puisse se recueillir devant les tombes de ceux qui, comme Toussaint Louverture (Haiti) ou Victor Schoelcher (Guadeloupe), ont lutté contre l’esclavage. Des expositions, lectures de textes et autres activités culturelles sont prévues à la capitale française et en province, notamment à Bordeaux et Nantes, ainsi qu’à Gorée (Sénégal), d’où sont partis des esclaves vers l’Amérique. The French president calls the [Transatlantic] trade in African slaves a disgrace and invites the French to "look all of our past in the eye," "without concession". Abdou Diouf, La Francophonie's Secretary General, salutes Chirac's decision. This commemoration, states he in a press release received by AlterPresse, "seeks to inform humanity of the gravity of the dramatic period of the slave trade." ... At the musee du Pantheon, admission is free this May 10 so that the public may reflect on the tombs of those who, like Toussaint Louverture (Haiti) [pictured below] and Victor Schoelcher (Guadeloupe) [sic], fought against slavery. 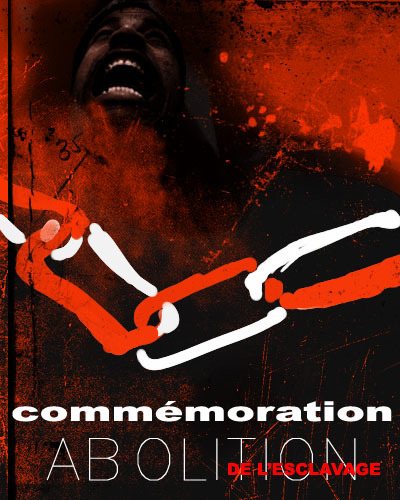 Exhibits, readings and other cultural activities are scheduled in the French capital and outside of it, in Bordeaux and Nantes but also in Goree, Senegal, a departure port of slaves towards the Americas. Kevin's flickr photo journal of Haiti gets two thumbs down. If a picture is worth a thousand words, the pictures Kevin shows speak louder than any article. The photo journal does what mainstream journalists usually do when they show Haiti: show the very worst and the very worst *only*. Some would argue that the shock created by the pictures helps bring attention to the problems. Hmmm... only partially. At this point Haiti is dealing with a "helplessly hopeless and darn right cursed" image that MSM tend to feed into. Needless to say, why help the "helplessly hopless"? I almost regret the thumbs up I gave him for the vodoun story because the photo journal will no doubt have more of an impact than the article. I recently wrote a DR of Congo blogger to ask him if I could use some of his pictures on DR of Congo public transportation on Global Voices. His answer: yes but under one condition: that the pictures not be used to promote what he called "povertyism". I told him not to worry. I knew all too well what he was referring to. Showing misery is one thing. Showing only misery and none of the self-help and hope is another. Can you imagine showing only Harlem's projects to report on New York? Or only the worst banlieues where buildings have no windows to represent Paris? That is just what Kevin Sites does in these pictures. Call me crazy but "reporting" is not the same as one of those "the cost of a cup of coffee" Sally Struthers ads we're used to seeing on TV. There is something exploitative about the choice of pictures Kevin put in his Flickr photo journal, especially in comparison to the other countries represented on the photo journal. Consider Martin Baran's recent pictures of Hinche, Haiti. Do they sugar coat anything? No. There is a picture of a smiling woman at a cybercafe, the chief means by which Haitians communicate with their relatives abroad. There is a picture of not necessarily wealthy women eaking out a living the best they can at the market. There are pictures of several local churches and schools. We get to see people *living their lives*, in the thick of the hustle and bustle of their daily routines, despite the terrible odds. Is that a fairer photo journal of the country? I'll let you answer that for yourself. Okay then Kevin, about your voodoo comment ["I've heard so much about this island nation awash in voodoo"], we might have used a bit more context seeing as how many (if not most) in your audience think that when you are talking about voodoo, you are talking about putting pins in a doll to get rid of someone. If there was ever an area that needed more context and merits a video, it would be that one. Please chime in and let me know what you think. (I am still chewing on his "mud pie" story and will have to get back to you after I've thought it over some more.) For now, the watch seems to be yielding some results. Kevin, you can continue differentiating yourself from incomplete, unethical coverage of Haiti by showing some of the social and ethnic diversity in Haiti as well some of the country's beauty. Hopefully you won't disappoint. There are plenty of beautiful spots in the country, the capital included, that you can immortalize. Again, make sure you let the world see those sites that Haitians hold dear but that are consistently ignored by many mainstream journalists looking to cover only the sensational. See you soon as the Watch continues. 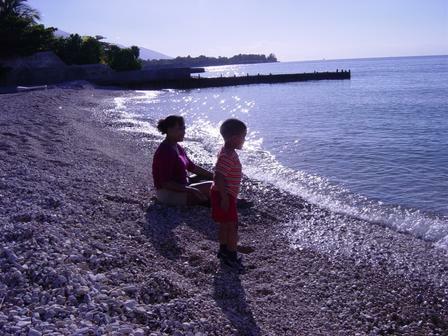 Pictured above: Moulin Sur Mer, Western Department, Haiti. Okay, I'll admit it. When I posted earlier about a discussion needed at We Media 2006 about "Christiane Amanpour-style reporting" and its effects on Haiti, I had not the slightest clue who Kevin Sites was. Then Yon Ayisyen blogged about him being in Haiti. Then a friend emailed asking what I thought about it since I had just blogged about "Christiane Amanpour-style" Haiti coverage. I've heard so much about this island nation awash in voodoo and grinding poverty, but I've never set foot on its soil. there is a decent video story on a Haitian school. He also throws in a video of a man who makes metal art. With honest, thoughtful reporting we'll strive to establish Kevin Sites in the Hot Zone as a forum for information and involvement. Users will not only learn about the scope of world conflict, but will find ways to be part of the solutions- through dialogue, debate, and avenues for action. Can you tell I'm a tad skeptical of the mission? Especially since KS is supposed to only cover Hotzones and his audience is presumably peppered with thrill seekers who will need something to chew on. How is he going to strike that balance in the end? Can he strike that balance? This is all to say that Kevin Sites and you and me are going to spend lots of time together during his stay in Haiti and that while we will give him the benefit of the doubt that he is *not* Christiane Amanpour, we will make sure to let him know if he turns out to be. Fair enough? Please make sure to post here if anything jumps at you as you follow his coverage, that we may compare notes. 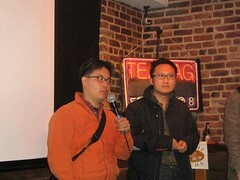 Francis Hsueh and Steve Hahn, makers of PARTY at a March screening for TeabagNYC Film series. Haitian diaspora blogger Nightshift Chronicles has a very interesting post on Garifunas, Maria Elena Maximo (i.e. immigrants who rob undocumented immigrants of their life savings) and today's boycott.